A fully mobile and connected society is expected in the near future, which will be characterized by a tremendous amount of growth in connectivity, traffic volume and a much broader range of usage scenarios. Some typical trends include explosive growth of data traffic, great increase of connected devices and continuous emergence of new services. Besides the market requirements, the mobile communication society itself also requires a sustainable development of the eco-system, which produces the needs to further improve system efficiencies, such as spectrum efficiency, energy efficiency, operational efficiency and cost efficiency. To meet the above ever-increasing requirements from market and mobile communication society, next generation access technologies are expected to emerge in the near future which shall support the KPI targets defined in this section. Peak data rate is the highest theoretical data rate which is the received data bits assuming error-free conditions assignable to a single mobile station, when all assignable radio resources for the corresponding link direction are utilised (i.e., excluding radio resources that are used for physical layer synchronisation, reference signals or pilots, guard bands and guard times). The target for peak data rate should be 20Gbps for downlink and 10Gbps for uplink. Peak spectral efficiency is the highest theoretical data rate (normalised by bandwidth), which is the received data bits assuming error-free conditions assignable to a single mobile station, when all assignable radio resources for the corresponding link direction are utilised (i.e., excluding radio resources that are used for physical layer synchronisation, reference signals or pilots, guard bands and guard times). The target for peak spectral efficiency should be 30bps/Hz for downlink and 15bps/Hz for uplink. Higher frequency bands could have higher bandwidth but lower spectral efficiency and lower frequency bands could have lower bandwidth but higher spectral efficiency. Thus, peak data rate cannot be directly derived from peak spectral efficiency and bandwidth multiplication. Bandwidth means the maximal aggregated total system bandwidth. It may be supported by single or multiple RF carriers. Control plane latency refers to the time to move from a battery efficient state (e.g., IDLE) to start of continuous data transfer (e.g., ACTIVE). The target for control plane latency should be 10ms. The time it takes to successfully deliver an application layer packet/message from the radio protocol layer 2/3 SDU ingress point to the radio protocol layer 2/3 SDU egress point via the radio interface in both uplink and downlink directions, where neither device nor Base Station reception is restricted by DRX. For URLLC, the target for user plane latency should be 0.5ms for UL, and 0.5ms for DL. Furthermore, if possible, the latency should also be low enough to support the use of the next generation access technologies as a wireless transport technology that can be used within the next generation access architecture. For eMBB, the target for user plane latency should be 4ms for UL, and 4ms for DL. For infrequent application layer small packet/message transfer, the time it takes to successfully deliver an application layer packet/message from the radio protocol layer 2/3 SDU ingress point at the mobile device to the radio protocol layer 2/3 SDU egress point in the RAN, when the mobile device starts from its most “battery efficient” state. For the definition above, the latency shall be no worse than 10 seconds on the uplink for a 20 byte application packet (with uncompressed IP header corresponding to 105 bytes physical layer) measured at the maximum coupling loss (MaxCL) of 164dB. Mobility interruption time means the shortest time duration supported by the system during which a user terminal cannot exchange user plane packets with any base station during transitions. The target for mobility interruption time should be 0ms. 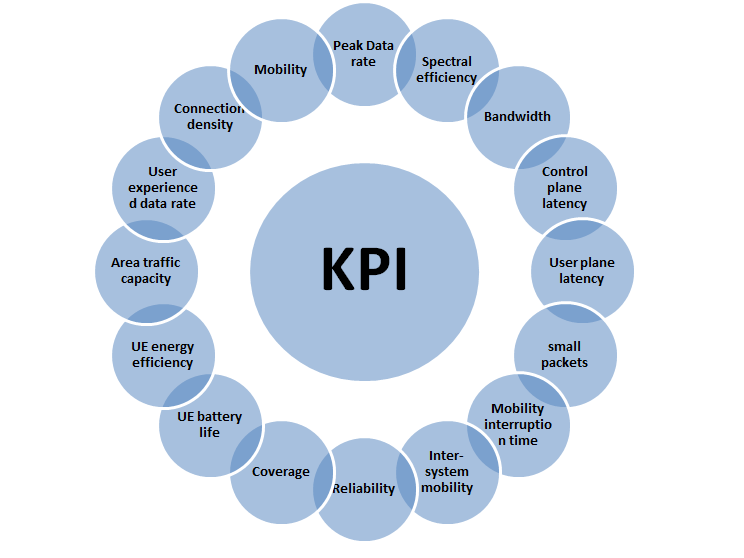 This KPI is for both intra-frequency and inter-frequency mobility for intra-NR mobility. Inter-system mobility refers to the ability to support mobility between the IMT-2020 system and at least one IMT system. Reliability can be evaluated by the success probability of transmitting X bytes within a certain delay, which is the time it takes to deliver a small data packet from the radio protocol layer 2/3 SDU ingress point to the radio protocol layer 2/3 SDU egress point of the radio interface, at a certain channel quality (e.g., coverage-edge). A general URLLC reliability requirement for one transmission of a packet is 1-10-5 for 32 bytes with a user plane latency of 1ms. Reliability = 1-10-5, and user plane latency = 3-10 msec, when the packet is relayed via BS. Note that target communication range and reliability requirement is dependent of deployment and operation scenario (e.g., the average inter-vehicle speed). MaxCL in uplink and downlink between device and Base Station site (antenna connector(s)) for a data rate of 160bps, where the data rate is observed at the egress/ingress point of the radio protocol stack in uplink and downlink. The target for coverage should be 164dB. Link budget and/or link level analysis are used as the evaluation methodology. The MaxCL is evaluated via link budget analysis (supported by link level simulations). For a basic MBB service characterized by a downlink datarate of 2Mbps and an uplink datarate of 60kbps for stationary users, the target on maximum coupling loss is 140dB. For mobile users a downlink datarate of 384kbps is acceptable. For a basic MBB service characterized by a downlink datarate of 1Mbps and an uplink datarate of 30kbps for stationary users, the target on maximum coupling loss is 143dB. At this coupling loss relevant downlink and uplink control channels should also perform adequately. As the evaluation methodology, link budget and/or link level analysis are used for extreme long distance coverage in low density areas. UE battery life can be evaluated by the battery life of the UE without recharge. For mMTC, UE battery life in extreme coverage shall be based on the activity of mobile originated data transfer consisting of 200bytes UL per day followed by 20bytes DL from MaxCL of 164dB, assuming a stored energy capacity of 5Wh. The target for UE battery life for mMTC should be beyond 10 years, 15 years is desirable. UE energy efficiency means the capability of a UE to sustain much better mobile broadband data rate while minimizing the UE modem energy consumption. TRxP spectral efficiency NOTE1 is defined as the aggregate throughput of all users (the number of correctly received bits, i.e. the number of bits contained in the service data units (SDUs) delivered to Layer 3, over a certain period of time) divided by the channel bandwidth divided by the number of TRxPs. A 3 sector site consists of 3 TRxPs. In case of multiple discontinuous “carriers” (one carrier refers to a continuous block of spectrum), this KPI should be calculated per carrier. In this case, the aggregate throughput, channel bandwidth, and the number of TRxPs on the specific carrier are employed. A joint system level evaluation is to be performed for Indoor Hotspot, Dense Urban, Rural, and Urban Macro. By full buffer model: Total traffic throughput served per geographic area (in Mbit/s/m2). The computation of this metric is based on full buffer traffic. By non full buffer model: Total traffic throughput served per geographic area (in Mbit/s/m2). Both the user experienced data rate and the area traffic capacity need to be evaluated at the same time using the same traffic model. In order to improve area traffic capacity, 3GPP can develop standards with means for high spectrum efficiency. To this end, spectrum efficiency gains in the order of three times IMT-Advanced are targeted. Furthermore, 3GPP can develop standards with means for large bandwidth support. To this end, it is proposed that at least 1GHz aggregated bandwidth shall be supported. It is proposed to perform full buffer evaluation, using the spectrum efficiency results together with assumptions on available bandwidth and site density in order to derive a quantitative area traffic capacity KPI for information. User experienced data rate NOTE1 can be evaluated for non-full buffer traffic and for full buffer traffic. NOTE1: Non-full buffer simulations are preferred for the evaluation of this KPI. For non-full buffer traffic, user experienced data rate is the 5%-percentile (5%) of the user throughput. User throughput (during active time) is defined as the size of a burst divided by the time between the arrival of the first packet of a burst and the reception of the last packet of the burst. Here it should be noted that the 5% user spectrum efficiency depends on the number of active users sharing the channel (assumed to be 10 in the ITU evaluations ITU-R report M.2135 ), and that the 5% user spectrum efficiency for a fixed transmit power may vary with bandwidth. To keep a high 5% user spectrum efficiency and a few users sharing the channel, a dense network is beneficial, i.e. 5% user spectrum efficiency may vary also with site density (Site here refers to single TRxP). 5th percentile user spectrum efficiency means the 5% point of the cumulative distribution function (CDF) of the normalized user throughput. The (normalized) user throughput is defined as the average user throughput (the number of correctly received bits by users, i.e., the number of bits contained in the SDU delivered to Layer 3, over a certain period of time, divided by the channel bandwidth and is measured in bit/s/Hz. The channel bandwidth for this purpose is defined as the effective bandwidth times the frequency reuse factor, where the effective bandwidth is the operating bandwidth normalised appropriately considering the uplink/downlink ratio. In case of multiple discontinuous “carriers” (one carrier refers to a continuous block of spectrum), this KPI should be calculated per carrier. In this case, the user throughput and channel bandwidth on the specific carrier are employed. Connection density refers to total number of devices fulfilling a target QoS per unit area (per km2), where the target QoS is to ensure a system packet drop rate less than 1% under given packet arrival rate l and packet size S. Packet drop rate = (Number of packet in outage) / (number of generated packets), where a packet is in outage if this packet failed to be successfully received by destination receiver beyond packet dropping timer. The target for connection density should be 1 000 000 device/km2 in urban environment. 3GPP should develop standards with means of high connection efficiency (measured as supported number of devices per TRxP per unit frequency resource) to achieve the desired connection density. Mobility means the maximum user speed at which a defined QoS can be achieved (in km/h). The target for mobility target should be 500km/h. The capability is to minimize the RAN energy consumption while providing a much better area traffic capacity. Both qualitative and quantitative KPIs are proposed.